I've never been in shape. Thin, yes. Average size, yes. But never in shape. And every time I've attempted to get in shape I've come at it from the wrong place - a negative place. I want to be skinny, I want to be prettier, I want to fit into Hollister jeans. It was never because I wanted to be healthy or so I could live a long, flexible, happy life. And if I'm being perfectly honest, I always scoffed at those who did approach fitness with that it's because I care so much about my well-being (!) zeal. It's really because you want that tiny bikini bod, let's be honest I thought. Well, that's all changed. After housing and birthing two little humans over the past two and a half years, I've learned just how much we should care about our bodies, that it's on us if we want to feel good, and there could be potential consequences if we don't treat our bodies well. When I got pregnant with Ella, I was 129 pounds. I was the thinnest I'd ever been. My closet housed sizes 0-4 and I never had an easier time finding clothes than I did when I was that size. But the 4 flights of stairs that stood between me and my apartment door consistently reminded me I was badly out of shape. When I was pregnant with Ella, my doctor informed me that birth is a marathon. I quickly learned pregnancy was a marathon as well, and it was one I was not properly trained for. My joints ached, my back hurt. Sure, these are common occurrences while pregnant, but after I had Ella and I incorporated lifting car seats and a growing baby into my day-to-day and was constantly bending over (to change her, pick her up, etc.) I put stress on my already weakened body that it frankly couldn't handle. My left shoulder, neck, and lower back hurt so bad I ended up seeing chiropractors and had a stint of weekly massages. When all that healed, and I got into a new routine of yoga, I got pregnant again. More weight gained, more stress put on my body. Only during my last pregnancy, my neck and lower back were easily thrown out and for the first time in years my right knee was dislocated. So there were a few occasions when I was left with a heating pad or ice in bed, unable to move. I say all of this not to sound like a dramatic post-pregnant woman but to explain how my mindset on fitness changed. I was told by my doctor to do exercises to strengthen my back and I didn't do them. So what happened? My back became weaker and weaker until the point of sheer pain. 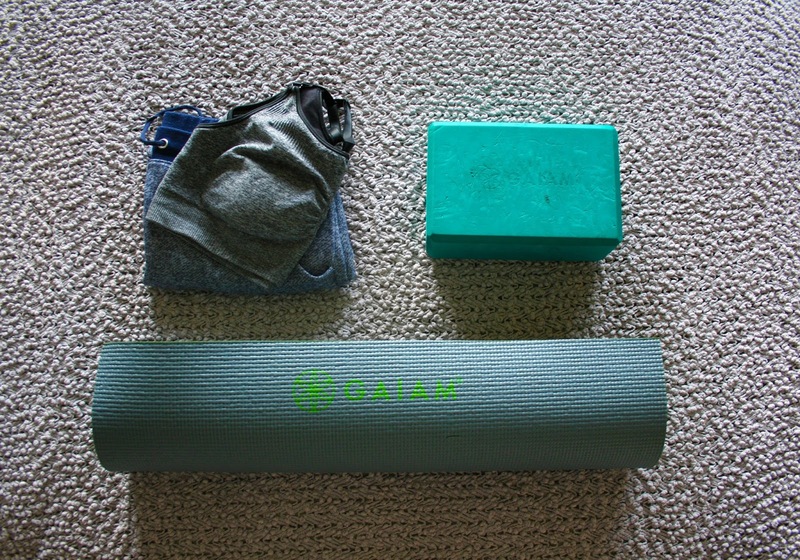 I recovered much faster after this pregnancy than I did with Ella and when I realized my back was in much more pain than anything post-labor, I asked my doctor if I could start doing a light, postpartum yoga routine in attempts to strengthen my body. She cleared me and I've been doing it since. I felt almost immediate relief on my back which has fueled me to break out my yoga mat at 6AM on little sleep. Aside from the few goals I have, transforming my body is my main priority this year. I would say it's a new year's resolution, but I started 2 weeks before the ball dropped. My reasons for doing so have changed -- to keep up with my kids, to gain energy, to (continue to) fight anxiety, to gain strength, and to look like Jane Fonda when I'm 75. Losing weight isn't my main goal, it really isn't. This isn't some plan to lose the baby weight. I won't be giving up dessert and I'll have a latte when I feel like it. (Moderation, people.) This is about having control over my body, not my body having control over me. I was hesitant to document this so early on. I just reached 6 weeks postpartum. But I decided to do so after going back and reading my early anxiety posts. I want to be able to track my progress and look back on my starting point. So stay tuned for fitness posts! The is a lot more to come.